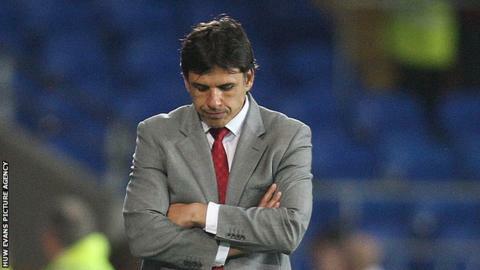 Manager Chris Coleman has admitted the pressure is on him to reignite Wales' 2014 World Cup qualifying campaign. Coleman has lost all four of his Wales games in charge, scoring just once, including a 6-1 thrashing by Serbia in Wales' worst defeat for 15 years. Coleman, who has replaced Aaron Ramsey as captain with Ashley Williams, knows Wales' campaign could be over should they lose to Scotland and Croatia. The best advice I got was from Jean Tigana, the French coach, at Fulham when I took the job. He said 'it doesn't matter where you go as a manager, don't completely unpack your suitcase'. "All you can do is affect the next game," said Coleman. "In the back of my mind there are different scenarios and you prepare yourself for that. "But I can't think like that. "I've had four games as manager of my country. I have lost four, so for me as a football person that don't sit well with me. I don't enjoy that. "The best advice I got was from Jean Tigana, the French coach, at Fulham when I took the job. He said 'it doesn't matter where you go as a manager, don't completely unpack your suitcase'." Coleman, appointed Wales manager in January following the death of Gary Speed, has already watched his side lose their opening two Group A qualifiers to Belgium and Serbia. The 42-year-old is now preparing Wales to face Scotland in Cardiff on 12 October before a trip to Croatia on 16 October - but admits his future is in the hands of Football Association of Wales chief executive Jonathan Ford. Asked about his future, Coleman said: "That's not my decision. I don't worry about that." Coleman inherited a side that had won four of their last five games before Speed's death in November. But Coleman insists he is to "start doing it the way he thinks, not the way someone else was doing it." "We all felt under pressure by the good run of games Wales had under Gary," admitted Coleman. "And this current crop of players were labelled the golden generation. Why? On the basis of what? Winning four games out of five? "I'm not having a go at our players, I'm trying to protect them. "But they'll be the golden generation when they succeed where everybody else has failed. Until that time, they are not the golden generation. "We need to put the brakes on a bit here. One minute we're saying we're in a tough group where we are fifth seeds - but then also saying we should qualify. Really? "We've got to get our first win to give us confidence to turn the corner. We've got to do things differently - and we've got to move on." Asked if their campaign would be over if Wales failed to get any points against Scotland and Croatia, Coleman admitted: "Of course. "If one of the teams above us wins and draws that'll be eight points - and maybe they can win both - then that's a big gap. "But I think I'd be a coward if I didn't get to this stage and change things. The worst thing you can do is nothing. I've never been one to bury my head in the sand if there's been one or two problems. "If we don't win the next two, three, four games or how ever long it is, at least I tried to do it the way I think it should be."